An important map of Virginia and one of the best known images of American cartography. "one of the most important maps of America ever produced and certainly one of the greatest influence" (Burden, p. 202). 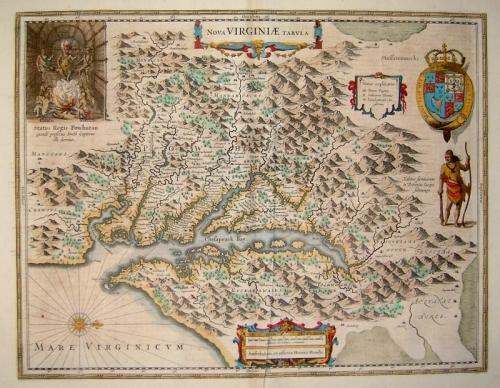 A strong imprerssion of Henricus Hondius' derivative of John Smith's highly important 1612 map of Virginia, based upon the 1618 map of Henricus' brother Jodocus Hondius, the plate for which had been sold to Willem Blaeu by Jodocus' estates after his death in 1629. This was one of the first maps engraved by Henricus for his Atlantis Appendix of 1630. It is the only edition of the map where the Indian faces the Chesapeake. In very good condition with very minor toning and a slight crease near the centerfold that could be removed.